Crisp fall weather has set in for good, and Halloween has passed, which means a fast-paced few weeks until that amazing celebration of all things delicious, Thanksgiving. This year, I am extra excited for Thanksgiving, because not only will I get the chance to see my family for the first time since June, but I will also get to see my boyfriend at the same time because he’s flying out to Massachusetts to spend the holiday weekend us! The past two Thanksgivings that I’ve had since starting medical school have been away from home, so I really miss being home with my family and being able to help make Thanksgiving dinner. Just three more weeks, I can’t wait! In any case, last year I was home visiting the family when I decided that it was finally time for me to tackle my own decadent carrot cake. 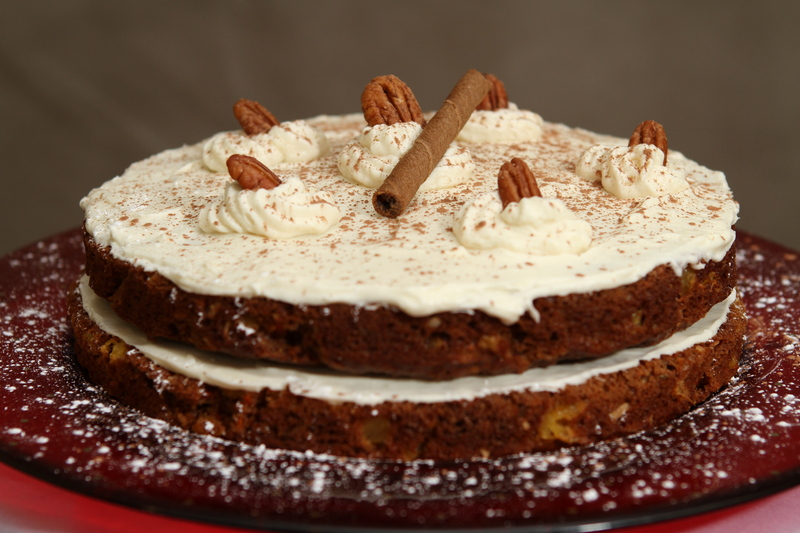 I’ve made some simple recipes that turned out so-so carrot cake. 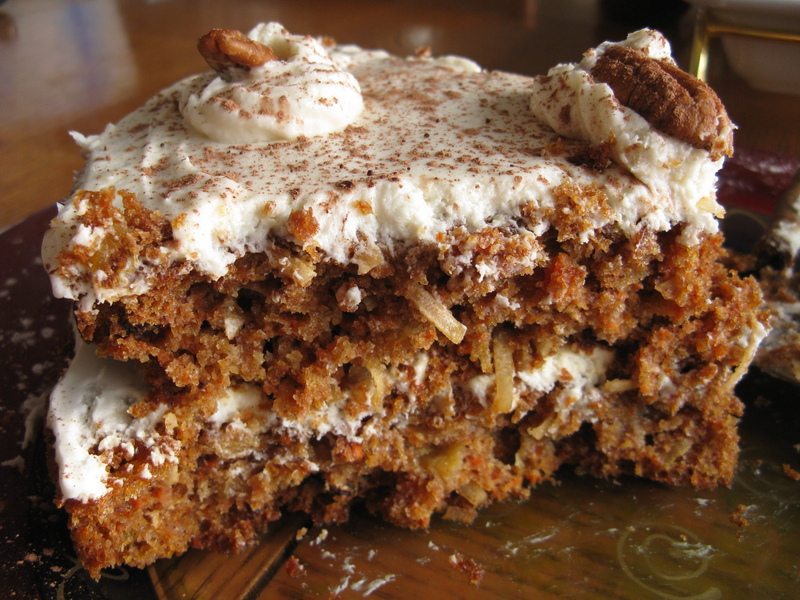 Especially those “light” carrot cakes that end up tasting more like cardboard than anything else. But this time, I really wanted it to be the irresistible kind you see in a big glass cake stand in the cozy neighborhood bakery, the kind of carrot cake where you just have to get a slice because it practically literally has your name on it. You know who I turn to when I want the best, most indulgent recipes? America’s Test Kitchen. Maybe it’s my Massachusetts hometown bias, since they are based in Newton, MA after all, but I just love how meticulous and well-tested their recipes are. The recipes are shared in their Cooks Illustrated magazine on a regular basis. I found the Cook’s Illustrated recipe for carrot cake with cream cheese frosting, as well as one for a lightened version also done by them, and I proceeded to tinker a little with them to find a happy medium between the two, which I call the Ultimate Carrot Cake with Cream Cheese Frosting (Lightened). You see, it tastes exactly like an indulgent slice of full-fat carrot cake, but it actually is lightened to some degree, and that’s why “lightened” is only carried in parentheses :P Needless to say, carrot cake isn’t diet food, no matter how many carrots you stick in there. But if you want to make a beautiful, moist cake that will be perfect for the holidays and is sure to please, you just can’t go wrong. 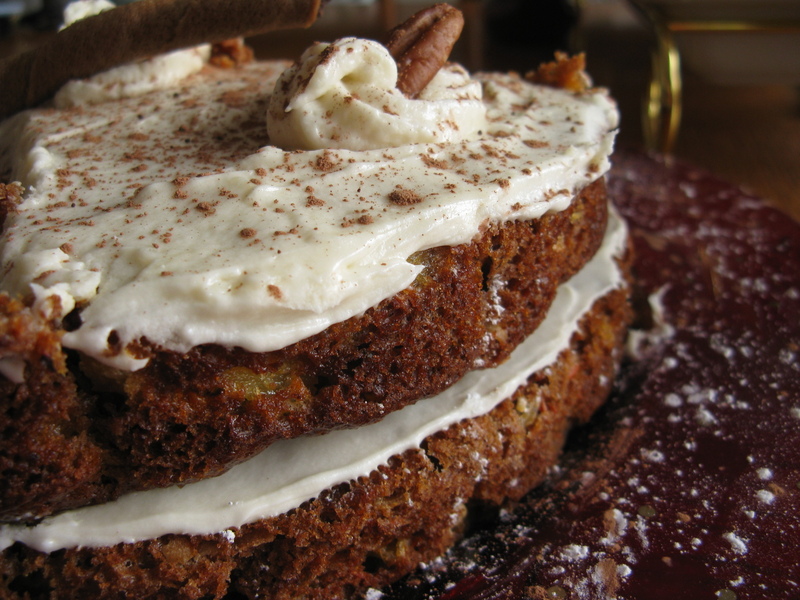 Don’t let the long ingredient list scare you, this is the ultimate carrot cake we’re talking about, remember? All this good stuff in it is what makes the cake so darned amazing. And pretty please, make it as a two-layer round cake, because it looks that much more incredible (especially if your decorating skills are good, unlike mine heh). Also, the picture below was taken using my dad’s DSLR… I asked him to focus on the tip of the pirouette, and realized later that the front of the cake was out of focus, oops. Still learning! Adapted from Cook’s Illustrated original and light recipes, shared on Sunday Nite Dinner. 1. Preheat oven to 350°F. 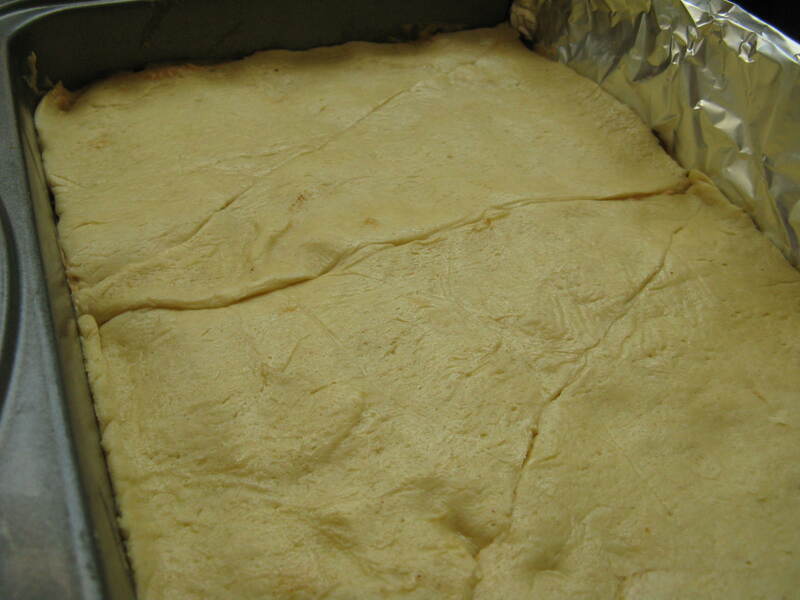 Grease two 9-inch round baking pans (or a single 9×13 pan) with vegetable oil. Line bottom of pan with parchment and brush oil on top. 2. 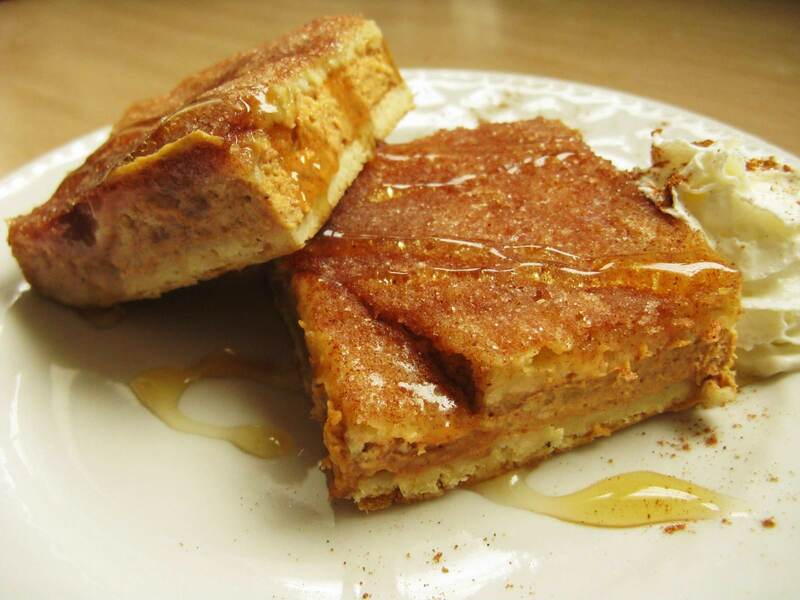 In a bowl, stir together flour, baking powder, baking soda, salt, cinnamon, and nutmeg; set aside. 3. In a separate large bowl, beat eggs, vanilla, granulated and brown sugars on medium-high with an electric beater until thoroughly combined, about 45 seconds. Reduce speed to low; with mixer running, add oil in a slow, steady stream. Increase speed to high and mix until mixture is light in color and well emulsified, about 45 to 60 seconds longer. 4. Turn off beaters, and using a spatula, fold in the flour mixture into the wet batter until just combined (do not over-stir). Towards the end, stir in the carrots, pineapple, coconut, raisins, and walnuts until mixed in. 5. 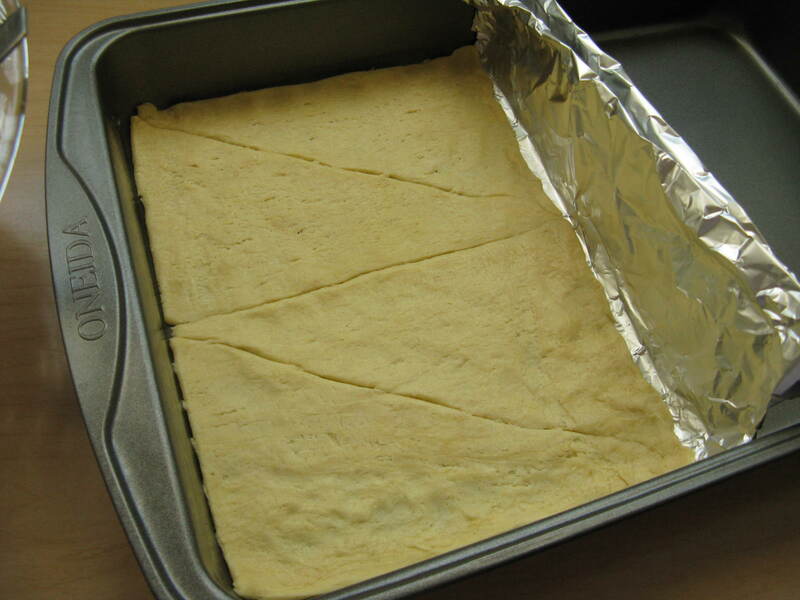 Pour into cake pan and bake until toothpick or skewer inserted into center of cake comes out clean, 35 to 40 minutes. On a wire rack, cool cake to room temperature in pan, about 1 hour. 6. For the frosting, mix cream cheese, butter, and vanilla in a large bowl at medium high speed with electric beater until well combined, about 30 seconds, scraping down bowl with rubber spatula as needed. Add confectioners’ sugar and mix until very fluffy, about 1 minute. 7. Run paring knife around edge of cakes to loosen from pan. Invert cakes onto wire rack, peel off parchment, then invert again onto serving platter. Frost cake layers as desired (note the amount of frosting called for above is enough to frost just the top and middle of a 2-layer cake; I would double the frosting recipe if you intend to cover the entire cake). Well, not to be outdone, I had my own ambitious project up my sleeve. Just the week before, I saw the most awesome heart cake tutorial on I Am Baker, and just knew that I had to try something that epic. 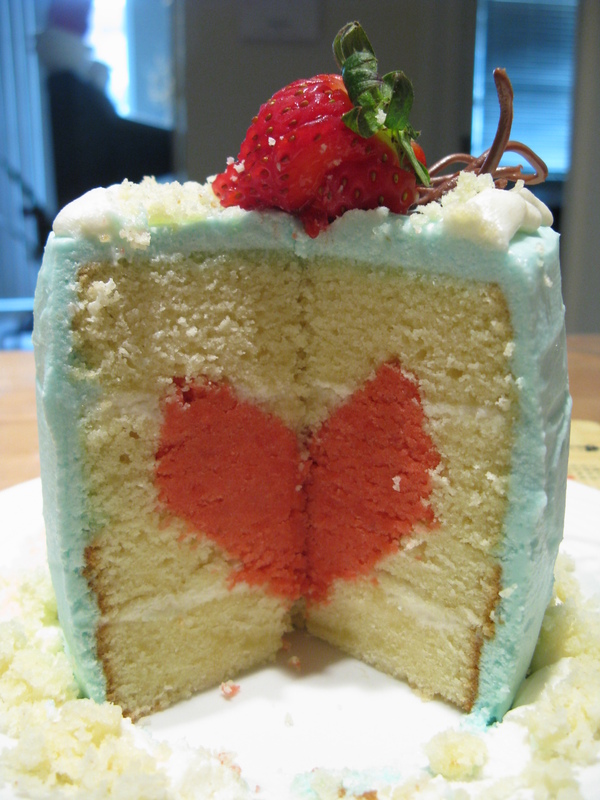 It’s a cake with a hidden red heart on the inside! All the way through the cake! I was just so smitten with the idea of this cake, and my Valentine’s Day visit to see my boyfriend was going to be the perfect time to try it. My gears turned and I started planning to make a much smaller version of the cake since it was just going to be the two of us eating it. 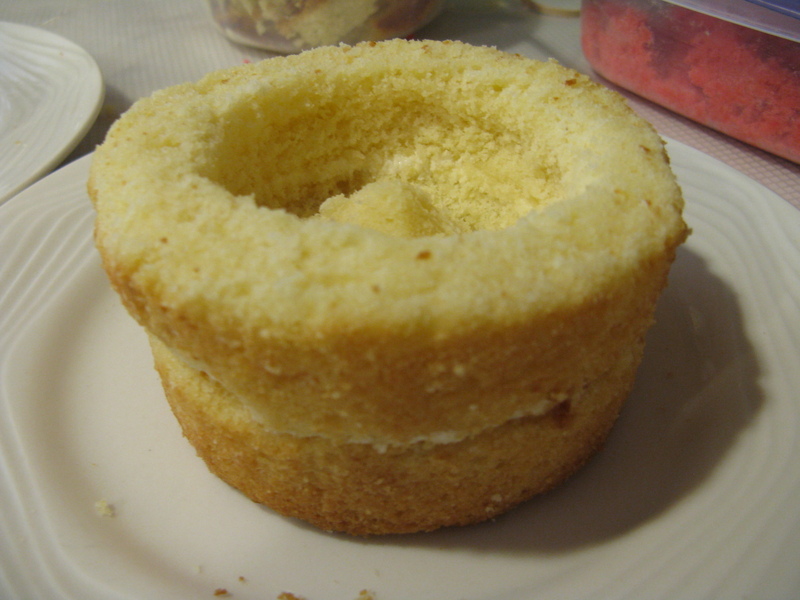 I decided that a 4″ diameter cake would be just the right size for two, and secretly purchased a 4″ diameter tall souffle ramekin to bake the cake layers (I think it was a 10 oz. ramekin). I wanted this to be a complete surprise, so I divided the task into two separate days. The first day I baked the cake layers while he was at work and then froze them overnight. I made the frosting and assembled everything the next afternoon while I kept him out of the kitchen. And finally after about 6 hours of total time baking and tinkering, it was done!!! And I rushed to bring him out so I could show him. Boy was he in for a surprise ;) At first… it just looked like a small and unsuspecting cake… which he really enjoyed the decoration of. It was my very first time decorating a cake with buttercream, and also my first time with a 4-layer cake. Daunting! I didn’t do a very good job with it, but I still had a lot of fun! 1. 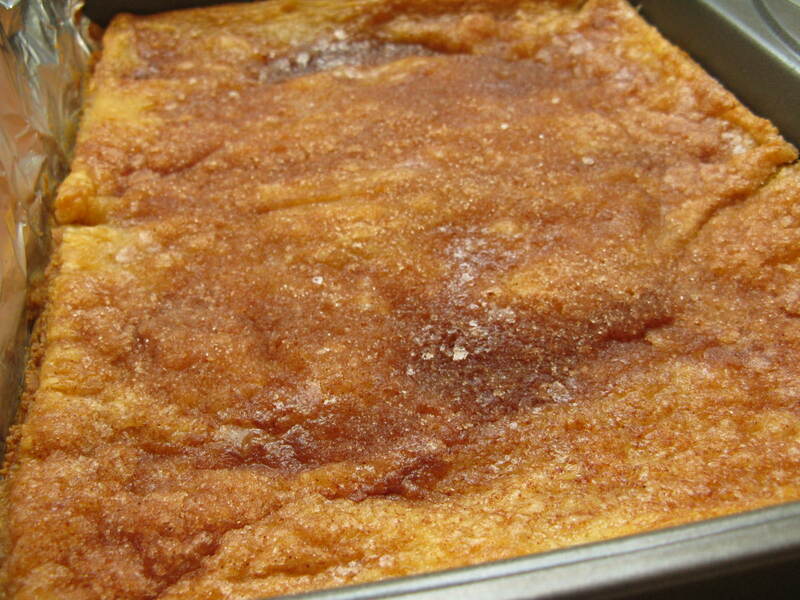 Preheat oven to 350 degrees F. Grease and lightly flour two 4″ souffle ramekins (10 oz. size). Cut out a circle of wax paper to line the bottoms of the ramekins for easy removal later. Also, line 3 cupcake tins with paper liners. I know, this already sounds complicated, don’t get discouraged! 2. 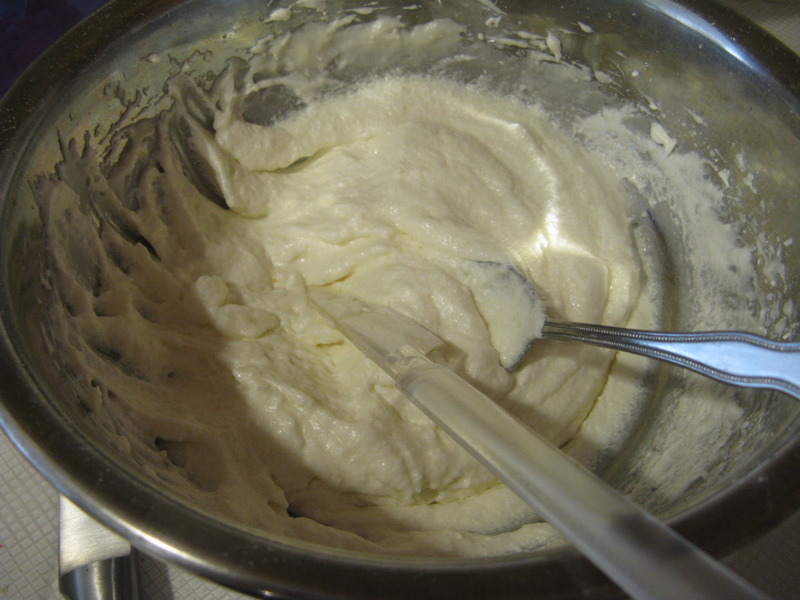 In a mixing bowl, cream butter until smooth with an electric mixer on medium. 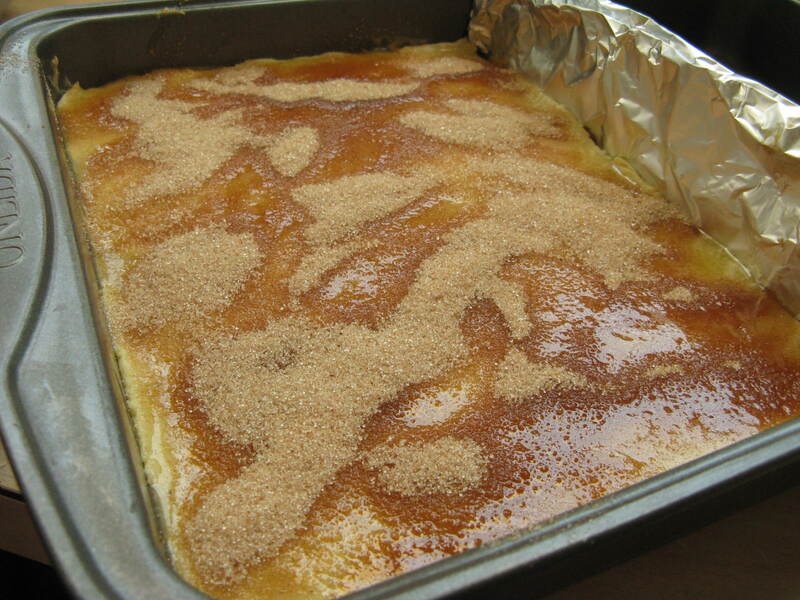 Then gradually add in sugar and beat until fluffy, about 3 minutes. 4. In a separate bowl, sift together flour, baking powder, and salt. Add the flour mixture to the egg mixture in 3 separate additions, alternating with the milk and vanilla. Beat until blended after each addition, but do not overbeat. 5. Separate out 1/3 of the batter and set aside. 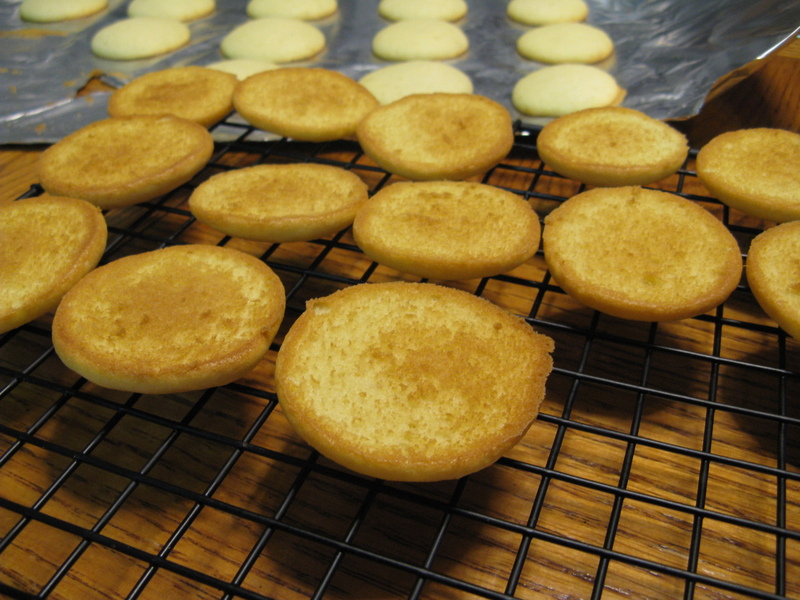 Using the remaining 2/3 of the batter, fill the two ramekins 2/3 – 3/4 of the way to the top, and begin baking in the oven. They will need at least 35 minutes to bake, start checking after 35 minutes using a toothpick inserted in the middle, they are done when the toothpicks come out clean (tops will probably be somewhat domed and cracked, but that’s fine). 6. 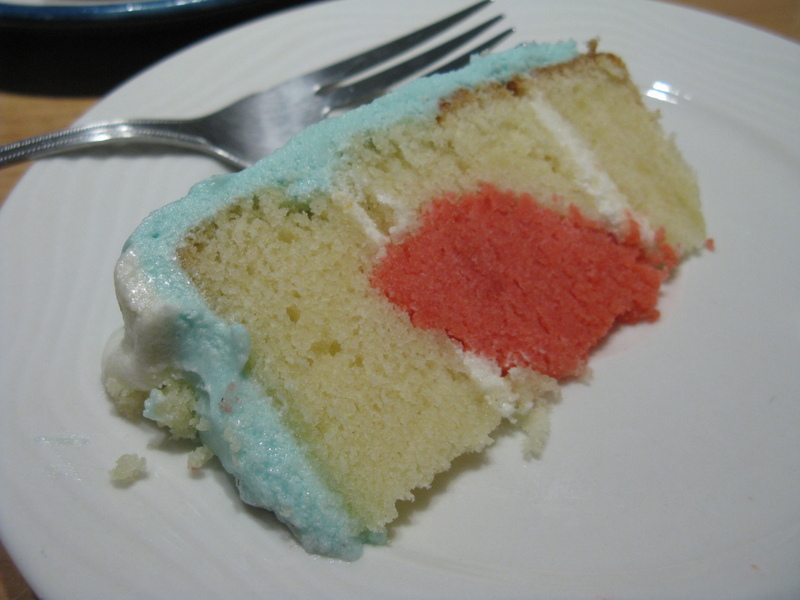 Meanwhile, add the red gel food coloring to the 1/3 of the cake batter that you set aside. Add a little bit at a time and whisk the color in evenly until you get a nice bright pink/red color that you are satisfied with. If you choose to use liquid food coloring, I don’t know the exact proportions, but I believe 1/2 tsp of gel is equivalent to about 1 oz. 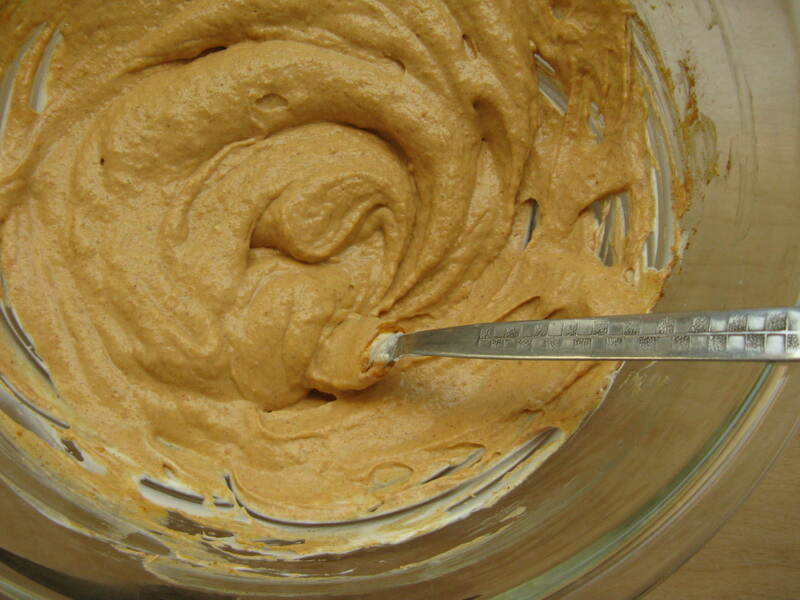 of liquid, although it will interfere with the liquid proportions of the batter, so use at your own discretion. 7. 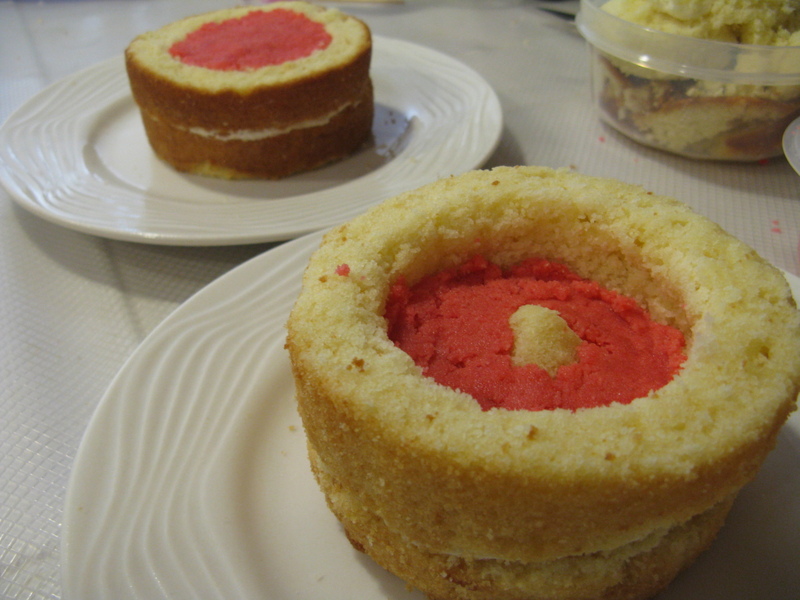 Fill the 3 lined cupcake tins with the red batter (about 3/4 full) and bake in the same oven at 350 degrees F for about 20-22 minutes, until the tops spring back lightly when touched. 8. When cakes/cupcakes are done, remove from oven and let cool for 10 minutes in the pans before removing to cool on a rack. 9. When cakes are cool enough to handle, take a knife and trim off the domed/cracked tops of the cakes to flatten them (enjoy the incredibly delicious tops that you just cut off, it’s really very heavenly to munch on these scraps!). 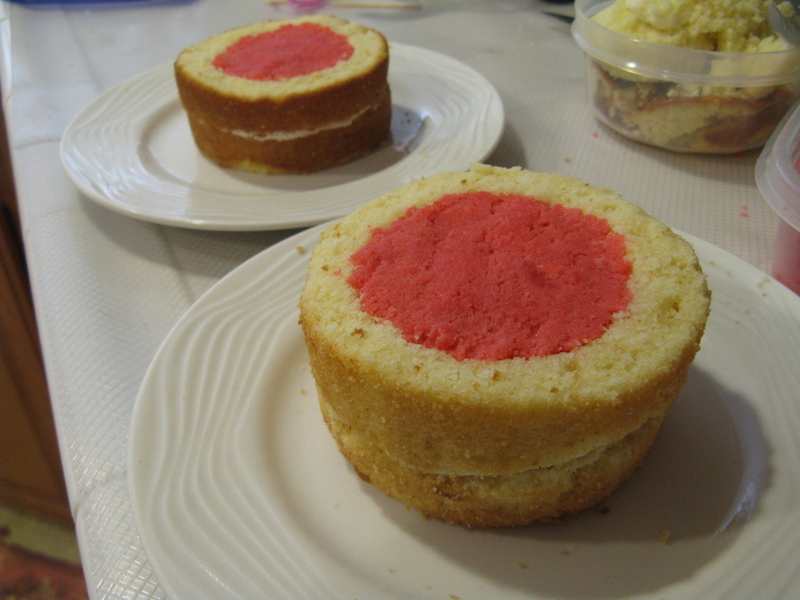 Then, split each cake horizontally in half to get 2 layers per cake. Allow layers to cool completely, then wrap each layer in saran wrap and put in the freezer overnight. For the cupcakes, peel off the paper liners and trim off the harder domed tops (but do not throw them away). 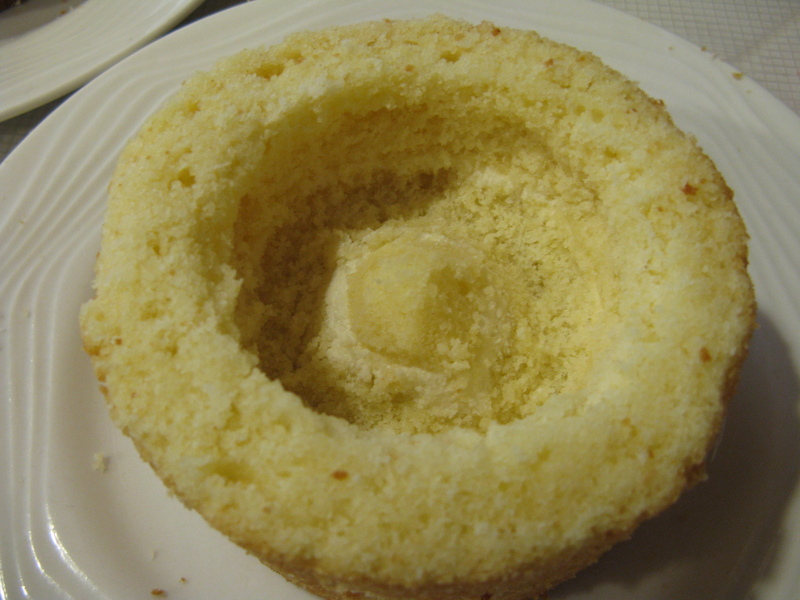 Using your hands or a fork, break the cupcakes into crumbs. Seal the crumbs and the tops you cut off together in tupperware and leave on the counter overnight. The tops will soften and you’ll be able to break them into crumbs as well the next day. 1. In a mixing bowl, place the softened butter and 2 cups of the confectioner’s sugar. Add the milk and vanilla, and beat until smooth and creamy. 2. 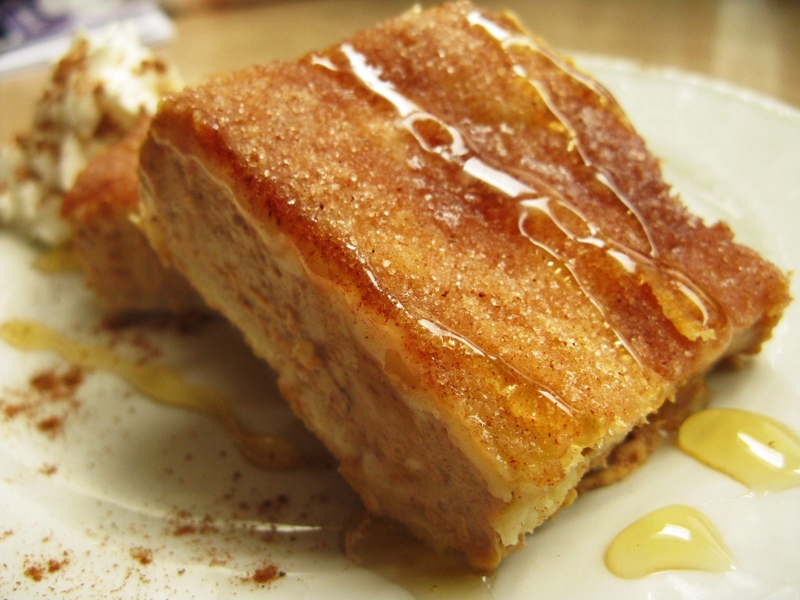 Gradually add more confectioner’s sugar as needed to achieve a desired spreading consistency. I probably used about 3 cups of sugar total. Assembling the Cake: now’s the interesting part, with more pictures too! 1. 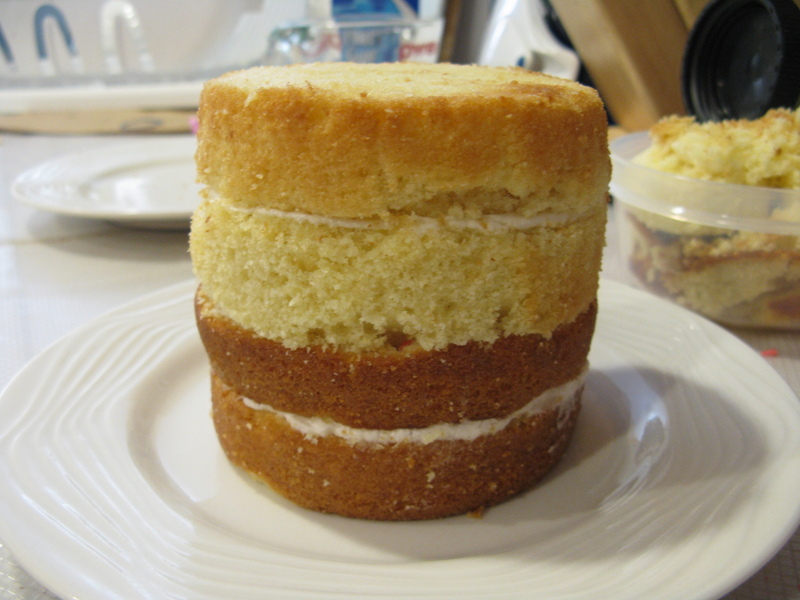 Take out your frozen cake layers and give them a trim to get them as flat as possible. I also stacked them on top of each other and trimmed around the edges to make sure they were more or less all the same size up and down. 2. Next, separate the 4 layers into 2 groups of 2 layers. 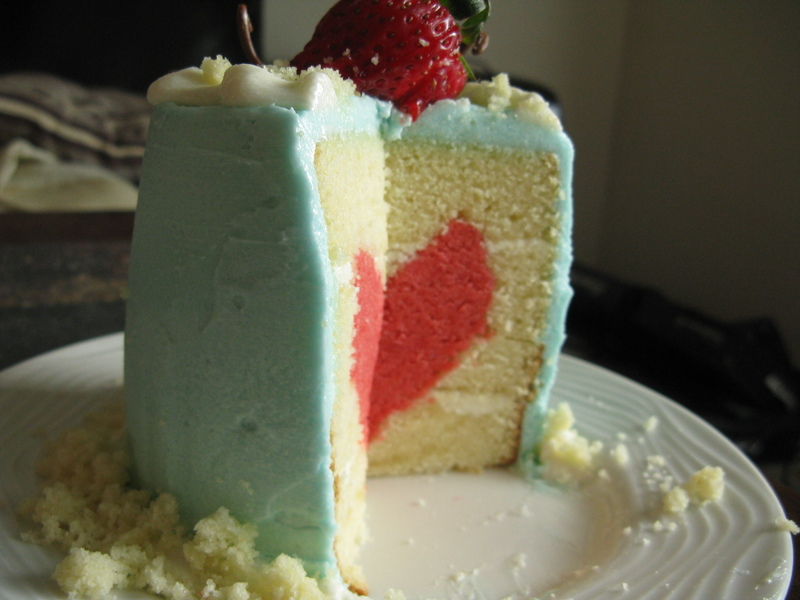 Spread a layer of the white frosting between each of the 2 layers, to form two separate 2-layered cakes. 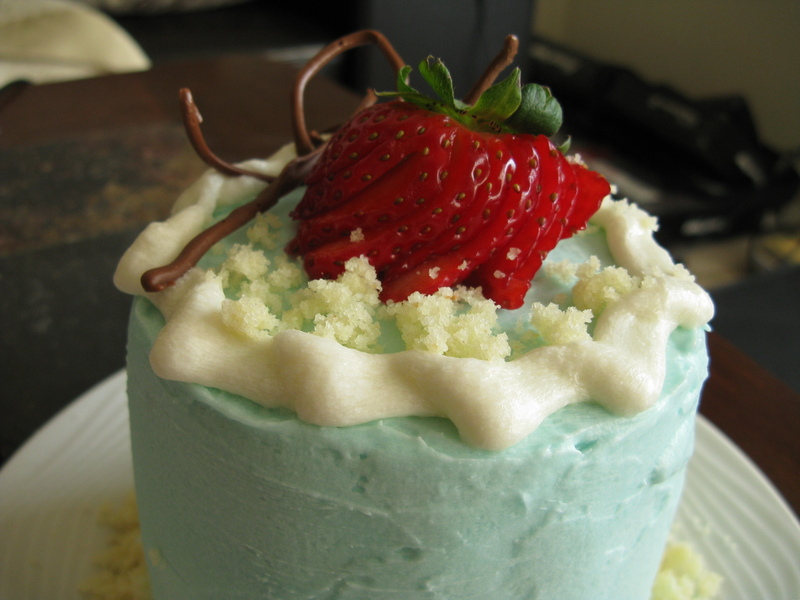 The cold from the frozen cake should set the frosting very quickly and they will hold together well. 4. 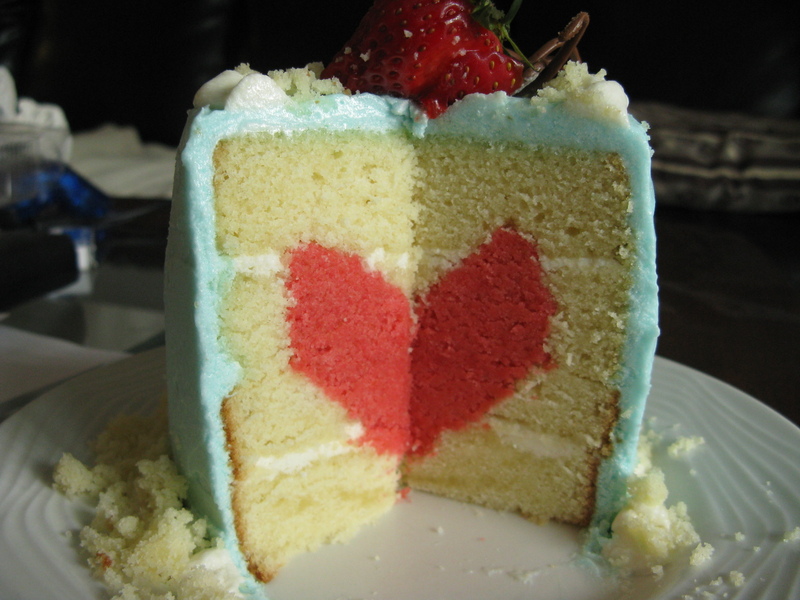 Next, you’ll want to carve the top of the heart into the other 2-layer cake. To do so, again trace a circle with the toothpicks, trying to get as similar of a location as possible with the other 2 layers you just did. 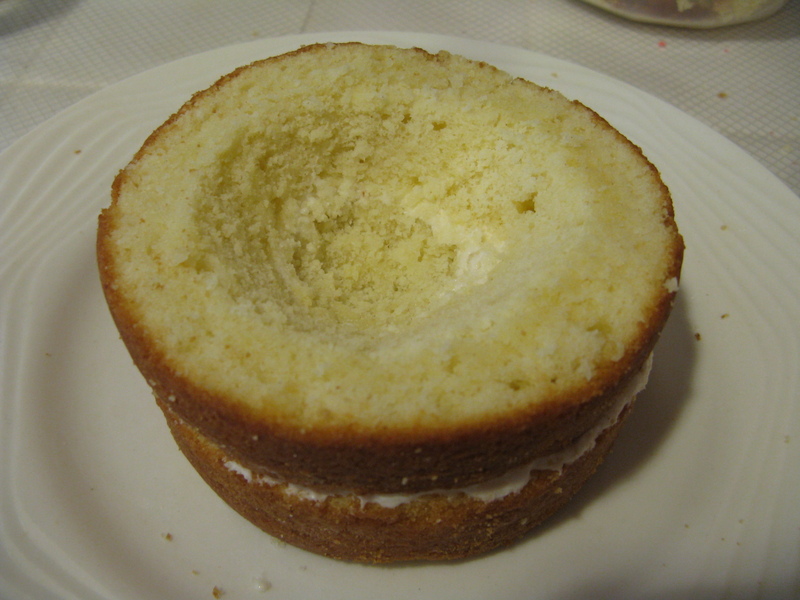 Taking your knife, now carve a small cylinder into the very center of the cake, but do not cut it out. Just carve a circle downwards into the cake. Next, using a similar slanted cutting motion, cut around the outer ring that you marked with your toothpick, trying to stop just at the cylinder that you carved in the center. Your goal is to make a channel around the cylinder. 6. Whew! Flip the cakes over and dust out the crumbs for the best-looking appearance later. We’re not far from the finish line! 7. 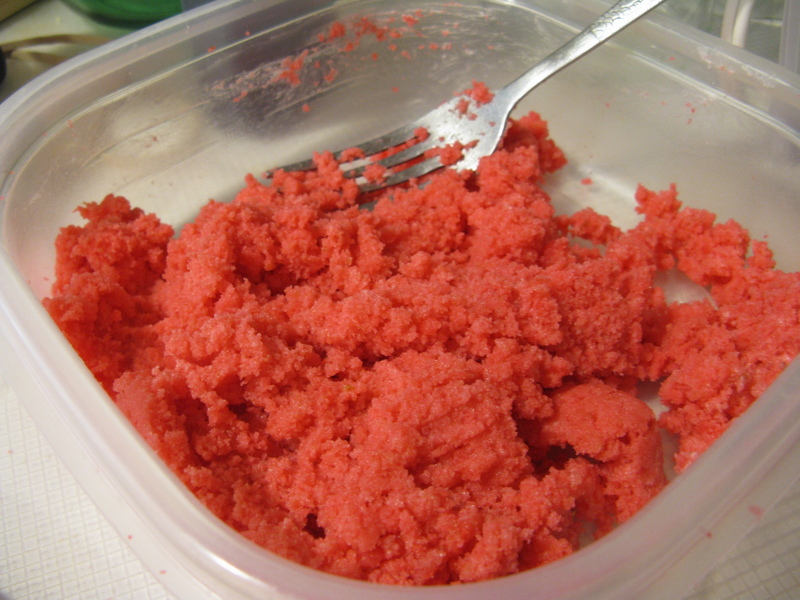 Now, add a few spoonfuls of your frosting to the red cake crumbs until they are nice and dense. If you’ve ever made cake balls before, the texture will be like that. I eyeballed about 1/2 cup of frosting for the red cake crumbs probably. 10. Now all that’s left to do is to frost the cake! 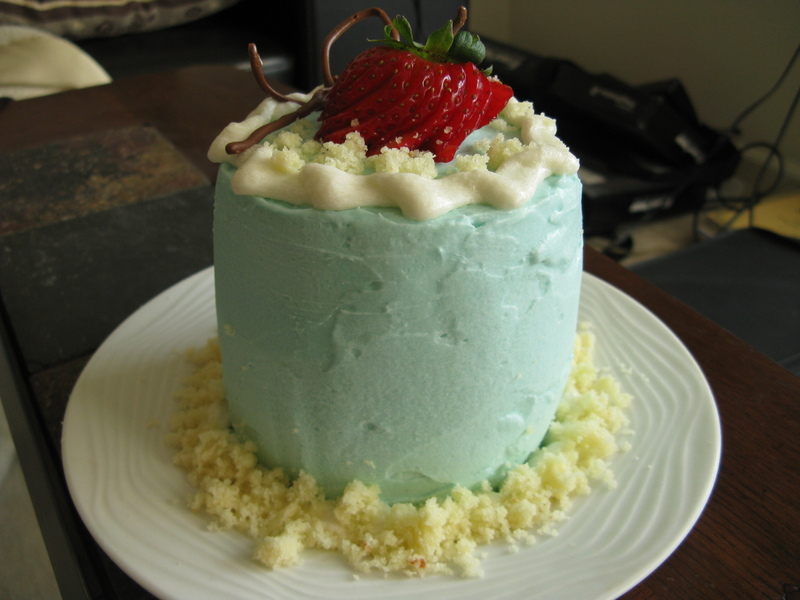 I added some blue gel food coloring to my frosting to get a light blue, since my boyfriend’s favorite color is blue. I set aside a few spoonfuls of the white frosting for piping on top later, and put that in the fridge to set a little. 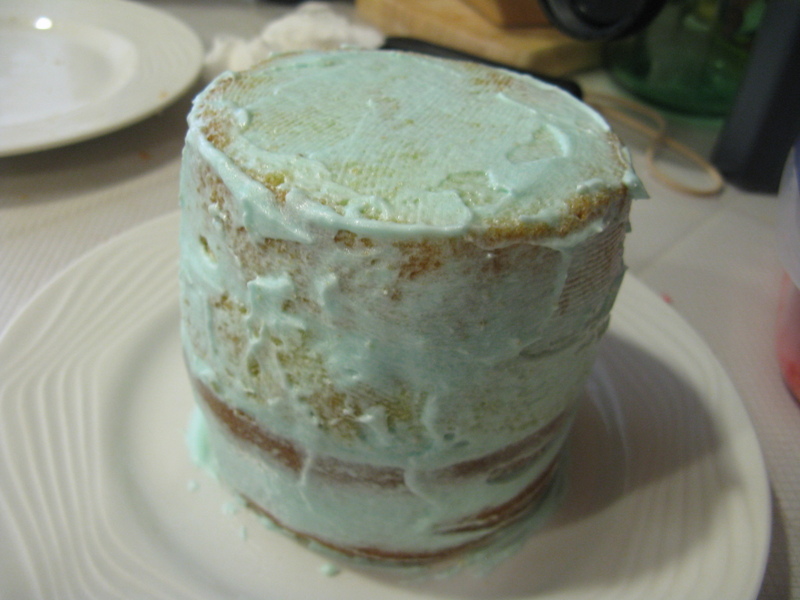 Then I applied a light coating of the blue frosting to the entire cake to seal off any crumbs (this is the crumb coat). I set the cake into the freezer for a few minutes just to let that set. 11. And then I just put on the rest of the frosting, playing around with it as I went since it was my first time working with buttercream. I put my cake back into the freezer multiple times just for a few minutes so that my frosting could set better and it was easier to layer on more frosting. While that was going on I also piped some melted chocolate onto wax paper in various shapes and put those in the freezer too for decorations. 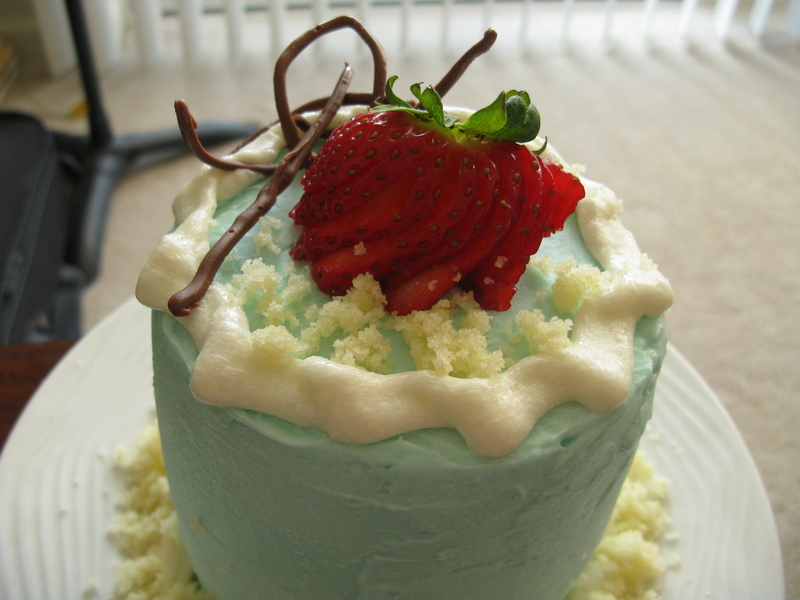 I cut up a fresh strawberry to fan out on the top of the cake as well (if you do this, do let the cut strawberry sit on a paper towel for a few minutes to make sure it does not leak juice onto the frosting). Finally, I crushed up some of my cake scraps into yellow crumbs and used that as sprinkled decorations around the bottom rim of the cake and a little on top! 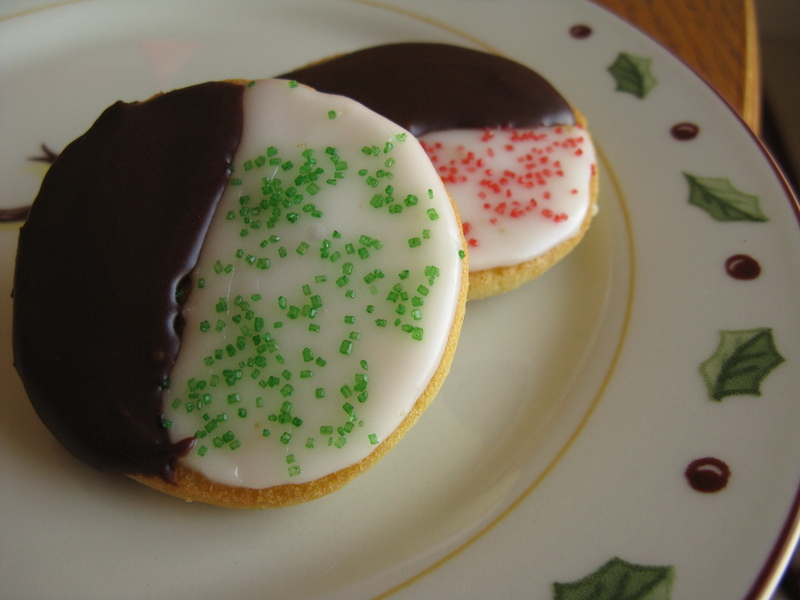 The chocolate decorations came out a little goofy because they melted when I touched them to adjust them. But here is the final product!! Yes, it's been half a year since my last update… medical school has been eating up all my time and not having my own kitchen nor my cooking and baking supplies is seriously hindering my ability to make things. I am loving it here in medical school though, so it's good that it's keeping me busy. I've learned so much in just the first semester of my first year… and even though I don't feel even remotely close to being competent enough to take care of anyone yet, I can definitely see myself getting better and better as I learn more things each day. It's an amazing and exciting feeling. I finally got a break over Christmas vacation to go home and enjoy the pleasures of having a kitchen and all the baking supplies I could want. I certainly didn't waste a minute! So the next few entries will be catching up on a few things I made for the holidays. 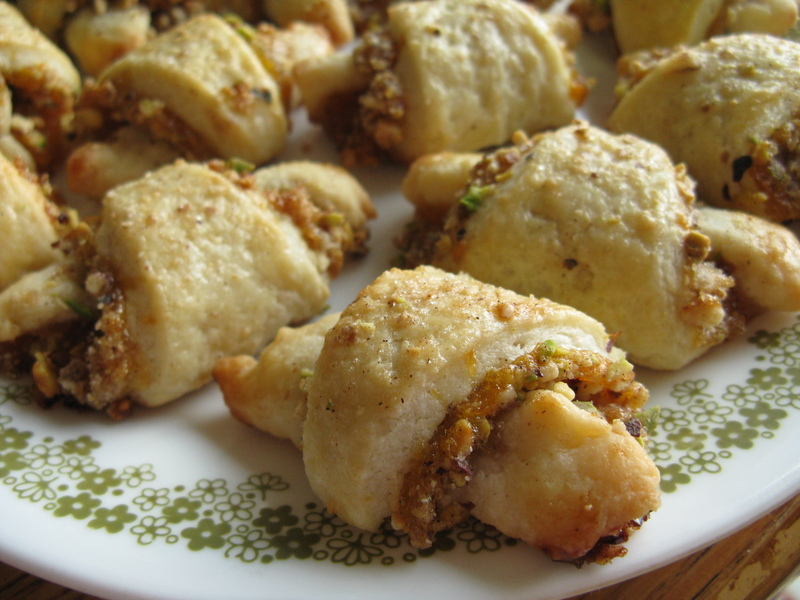 One pastry that I was introduced to in college was rugelach, a Jewish pastry that is similar to a cross between shortbread and croissant, with a filling that's usually fruit preserves and crushed nuts. 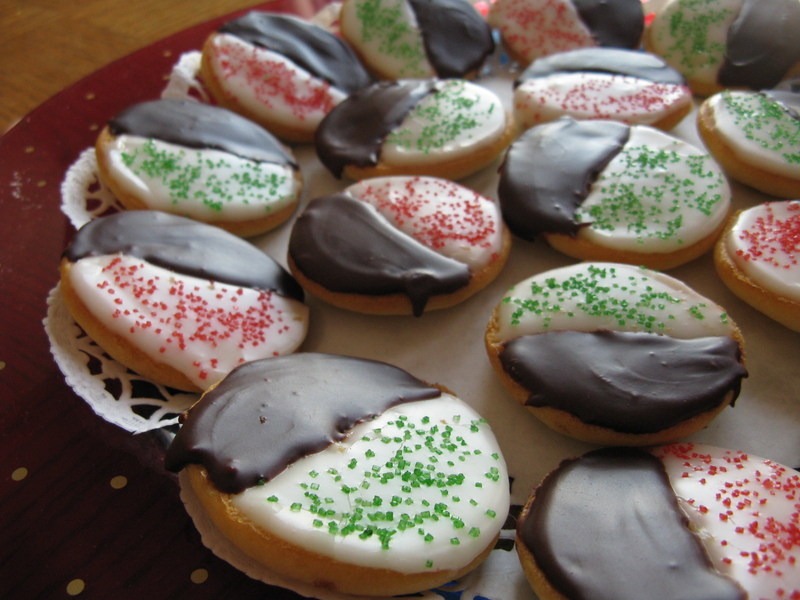 Its cream cheese dough is buttery and has a hint of cream cheese flavor that gives it just the right amount of tartness. 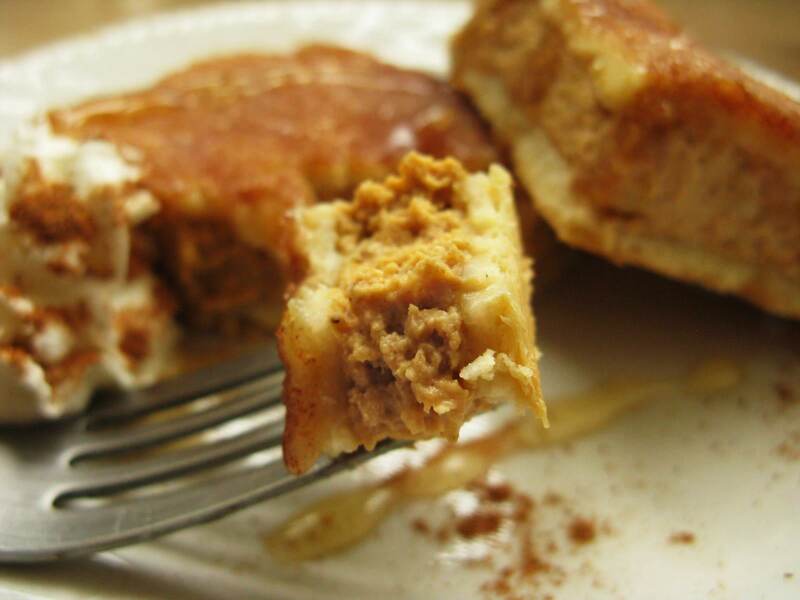 The textures and flavors all come together in a pastry that is neither too sweet nor too rich, which is really nice. I have had the Costco variety that is often spiraled with raspberry jam, apricot jam, or chocolate paste. 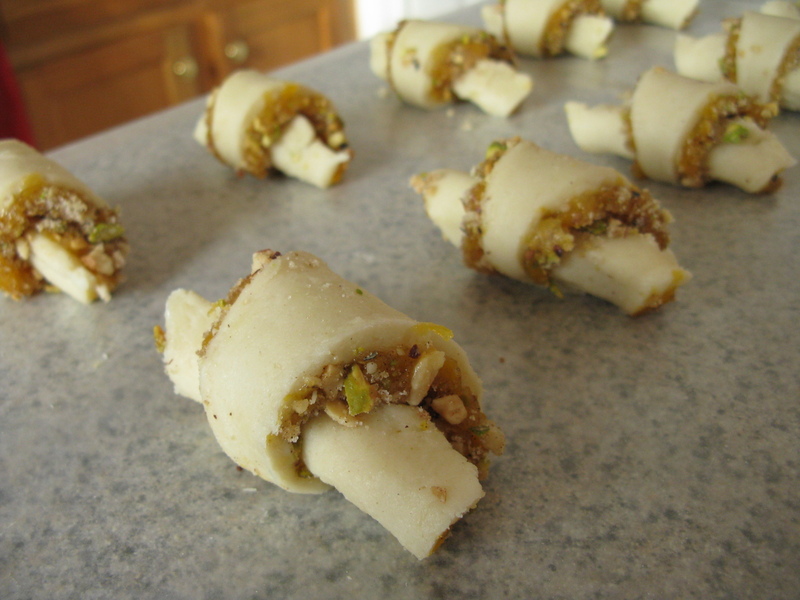 For my first try at rugelach, I made it with apricots, pistachios, and a cinnamon sugar mixture, and it was absolutely delicious. The texture of the pastry is like that of a soft (but not chewy) cookie, and it's conveniently bite-sized so it's great for impressing at parties. I made some over Christmas break to give to a friend recovering from open hip surgery, and he loved them! The dough can easily be frozen and stored for later (I baked some from a frozen batch to bring to my boyfriend in California the following week and he also loved them :) The hardest part is rolling out the dough and making the crescent shaped cookies ready to bake, but it is well worth the effort! 1. 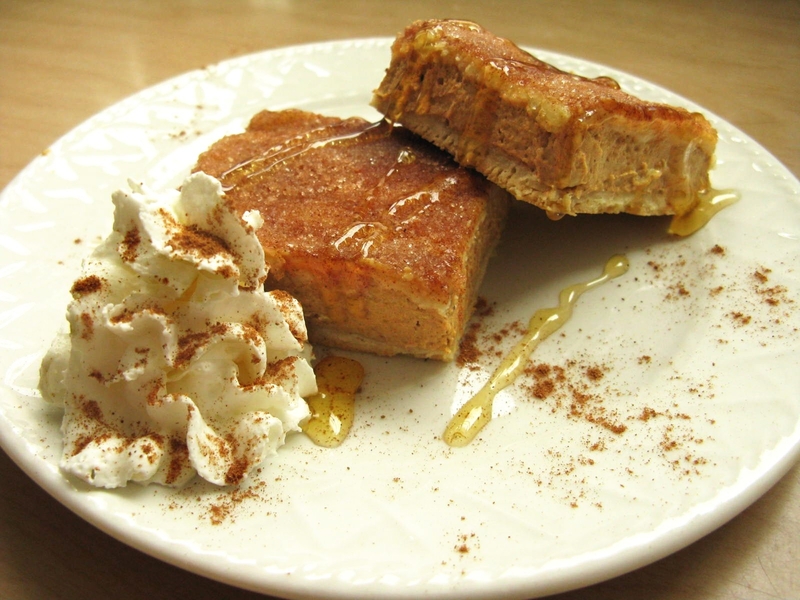 In a large bowl, cream together softened cream cheese and butter with electric beater until light and fluffy. Beat in the 1/4 cup sugar, salt, and vanilla. 2. Mix in flour on low speed until just combined. 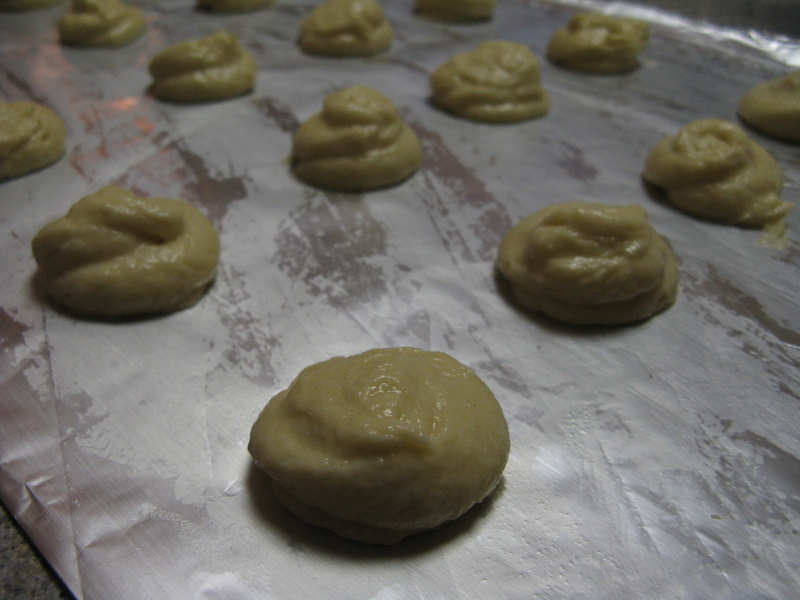 Take out dough onto a floured surface and roll into a ball. Cut into quarters and shape each quarter into a disc before wrapping in plastic wrap. Refrigerate for at least 1 hour. 3. Meanwhile, prepare the apricot for the filling. In a small saucepan, combine dried apricots and water, on low heat. Stir ocassionally until all the liquid is absorbed, about 15 minutes. Cool briefly, then puree in a food processor until smooth. 4. 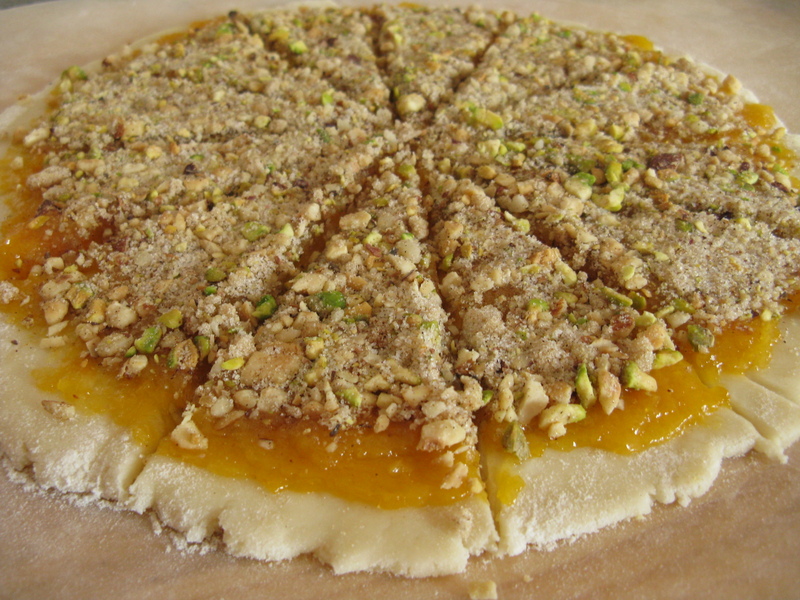 In a separate bowl, combine the 6 tbsp of white sugar, the brown sugar, cinnamon, and chopped pistachios. Set aside 3 tsp of this mixture for later. 6. Using a pizza cutter or a knife, divide circle into 12 equal wedges. 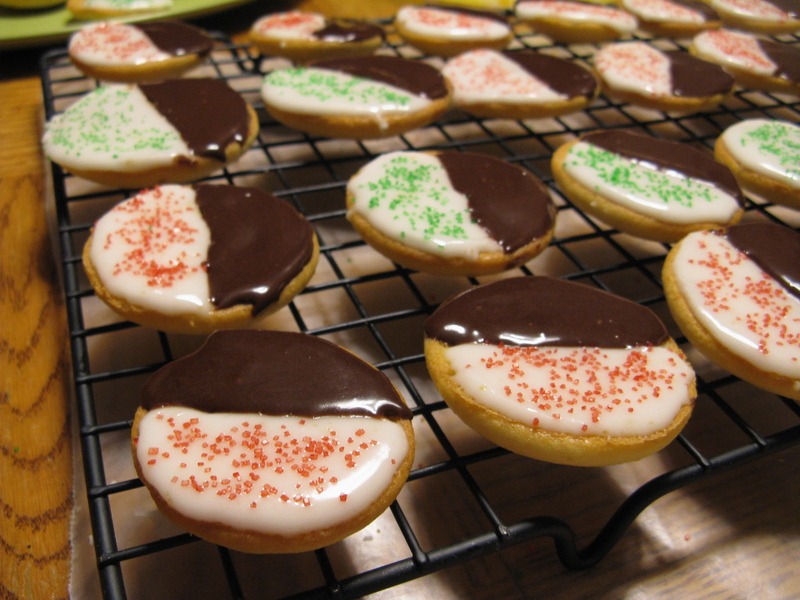 To help make them even, divide circle into quarters first, then divide each quarter into 3 wedges. 7. Gently remove one wedge at a time, using a spatula as necessary, and roll from the wide end towards the pointy end to make a pastry crescent. Set onto a baking sheet lined with a piece of parchment or wax paper, with the seam side down, 1 inch apart from one another. You can curve the points on either side to get a more cresent shape if you would like. Chill for 30 minutes on the baking sheet in a refrigerator. 8. 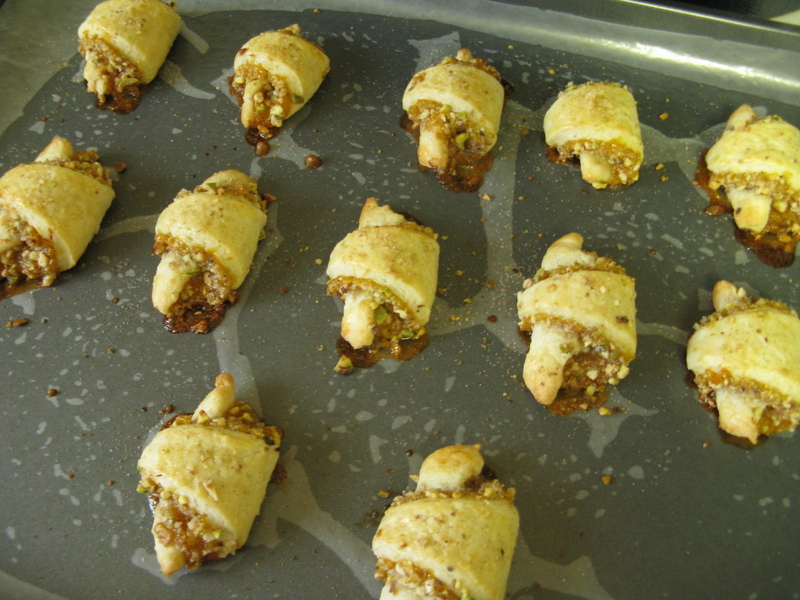 Preheat oven to 350 degrees F. Brush each rugelach piece with the prepared eggwash, and sprinkle some additional sugar and nut mixture on top from the reserved portion. 9. 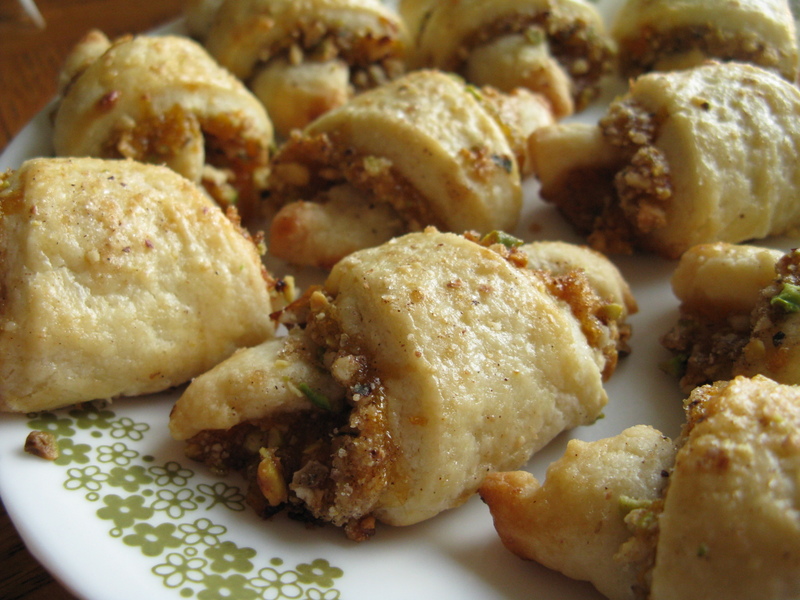 Bake rugelach for about 15-20 minutes, until lightly golden brown. Let cool for 2 minutes on baking sheet, then carefully transfer over to a cooling rack, using a spatula to help as needed (the filling tends to bubble out and stick to the baking sheet, so do this before it cools and hardens). 10. Dust with confectioner's sugar if desired, or serve as is. Yum!